Idiot Box (Episode) – From SpongePedia, the biggest SpongeBob-wiki in the world! A TV delivery truck comes and delivers a box with a TV inside it to SpongeBob and Patrick. However, they throw the TV away and jump in the box. Squidward comes and asks what they are doing. SpongeBob and Patrick say that they are using their imagination and ask Squidward to play with them. Squidward refuses and gets the TV from the trash can. Squidward then hears them start, it sounds like their mountain climbing inside the box. Squidward, annoyed by the sounds, kicks the box, causing an avalanche. Worried that SpongeBob and Patrick are really hurt, he taps the box, causing another avalanche. After hearing that the two's limbs are frozen and they need to cut them off, he opens the box in fear and finds out that it was nothing but sound effects. He closes the box and hears helicopter noises. He opens the box and questions SpongeBob and Patrick of how they can make the sound effects. Patrick says that Squidward needs a box and SpongeBob replies "and imagination." Squidward says that he has more imagination then the two. He goes back to his house and gets a hat box. He goes inside it but cannot make the sound effects. He kicks the box and police noises are heard. Thinking the police were there to arrest him, he goes outside to say sorry. He then realizes that the sounds are coming from the box. Angered, he kicks the hat box over to SpongeBob and Patrick and take the hat box. He goes inside to watch TV, but when he turns it on the only shows on were about boxes. He then hears rocket noises. Squidward then imagines that SpongeBob and Patrick have a tape recorder. He opens the box tells SpongeBob to give up the tape recorder. SpongeBob tells Squidward that they don't have a tape recorder, which Squidward refuses to believe. He hops inside the box to find out how their making the sound effects. But when they start, SpongeBob and Patrick only say random robot and pirate phrases (beep beep, for that you will walk the plank, etc.) with no sounds heard. He goes back to his house and keeps thinking about the box. He decides to sneak into the box while SpongeBob and Patrick are sleeping. He goes inside the box but finds no buttons or tape recorders. He pretends to drive a race car and hears the sounds. But in truth, a garbage truck is picking up the box and taking it to the dump. The next morning, SpongeBob and Patrick find out that their box is gone. They decide to go see Squidward. After that the episode ends. In this episode, Squidward pulls a sombrero out of a hat box and says "Why haven't I worn this?" He later then wears that sombrero in the episode The Camping Episode. When Squidward thought that the police were there to arrest him, it was actually sound effects about a guy named Johnny fleeing from the police saying, "You'll never get me alive coppers!" This is a spoof on a 1950s James Cagney movie called "White Heat." Patrick did not hear any sound effects, but he knows about the second avalanche. Squidward says "I hope they put some air holes in that box." However, the residents of Bikini Bottom do not require air for survival. In this episode, after SpongeBob told Squidward he can have the T.V., Squidward's mouth did not move when he said, "Oh boy, oh boy, oh boy!" When Squidward was being picked up by the Dump Truck, the box was flipped upside down. While he was in it, he remained unchanged. 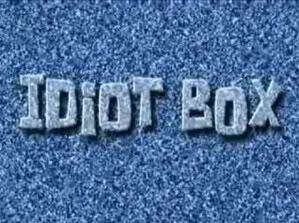 Idiot Box is another name for television. This is one of the ten episodes in which the title card has an animation. The others are SB-129, Pre-Hibernation Week, One Krab's Trash, SpongeBob Meets the Strangler, Skill Crane, Karate Island, All that Glitters, The Donut of Shame, and The Krabby Kronicle. When Squidward comes to check on SpongeBob and Patrick, the hat box is inside the big box. In the next shot of inside the box, the hat box is no where to be seen. It's still a mystery how the sounds were made. Even though SpongeBob told Patrick to keep hopping for thirty seconds after they got the box, they stopped six seconds later.